Radiohead and Kings of Leon will join Arctic Monkeys in headlining this year’s Reading and Leeds festivals, according to a line-up leaked earlier today. Kaiser Chiefs, Franz Ferdinand and Fall Out Boy are three of the bigger names settling on the purported undercard, while the likes of Foals, M.I.A. and Hot Chip manfully attempt to drum up some interest away from the main stage. 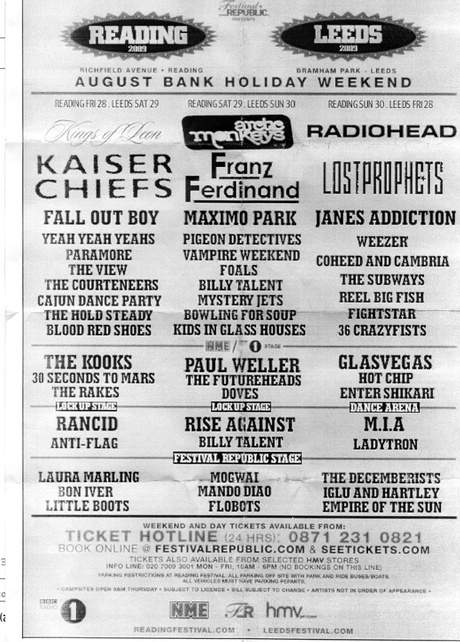 An image of the leaked bill – which you can see below – surfaced earlier today on the Punktastic forums and a separate source later confirmed its details as accurate to Thrash Hits Editor and friend of The Quietus Raziq Rauf. 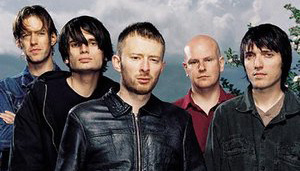 A certain amount of scepticism quite rightly surrounds a bill that casually finds room for 2002’s Lostprophets between Radiohead's artistic temperament and Perry Farrell’s ego, but chances are a fair number of these acts will be among those confirmed by NME.com at 7pm this evening. This year’s Reading and Leeds festivals take place from Friday 28th – Sunday 30th of August at Richfield Avenue and Bramham Park respectively. Tickets will set you back a not-at-all-outrageous £175 plus booking fee.